A person who takes action when the easiest thing to do is nothing. Upstander (Wear Orange) Day is October 24th, 2018! ​pick out what you are going to wear to show you stand up against bullying. "Thank you to every person who takes risks to stand up, even if the easiest thing to do, is to stand by". We wear ORANGE to show we always STAND UP for Kindness! Wear Orange Every Month to Show You Are an Upstander ALL Year! 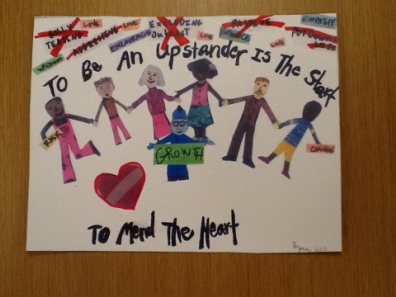 Be an Upstander: Stand up for Kindness Day! Ask myself, "How would I want to be treated?" Note where and when bullying occurs. Do something when I see someone being bullied - be an Upstander. Practice being a positive role model for my fellow students and share "Stand Up to Bullying" strategies with others. Choose not to join in when people are picking on or laughing at someone. Speak out against unkind words or actions. Say something helpful to the person who's being picked on or laughed at. Ask people who are teasing how it would feel if they were the ones being teased. Ask the person who's being left out or picked on to join you in an activity. Let an adult know what's going on.